There are many living things that are found in streams, rivers and lakes. 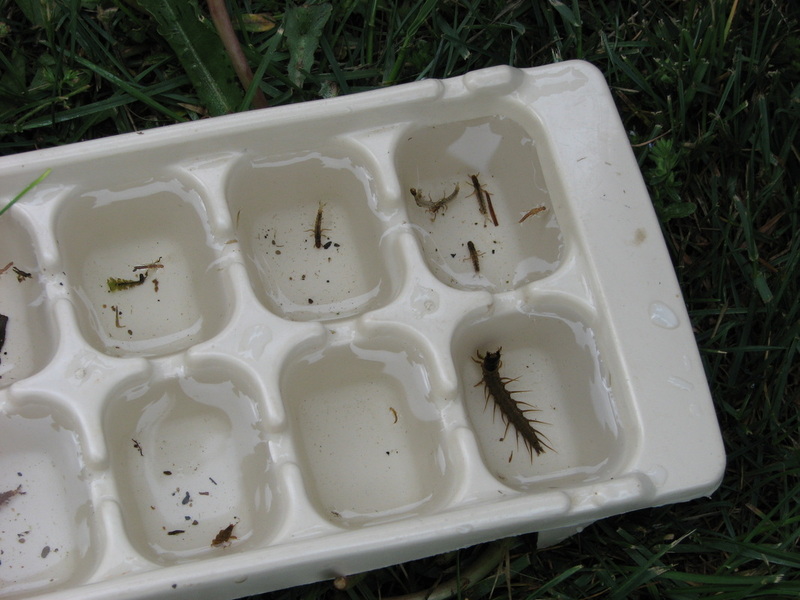 Aquatic macroinvertebrates are the aquatic insects or “bugs” that live in the water. Many of these “bugs” feed on plants and leaves that are found in the water while some eat other bugs. These bugs then become food for the fish that live there. The bugs that live on the bottom of the stream are not able to move around as much as fish do making them good indicators of stream health. Macroinvertebrate studies can be used to determine if a stream is polluted or not. In a stream that is not polluted there will be many different kinds of aquatic bugs. As pollution from AMD becomes worse in a stream, the more sensitive bugs such as mayflies, stoneflies and caddisflies begin to disappear. In a polluted stream, the most common bugs found are often midges, fishflies, craneflies, diving beetles and water boatmen because these bugs are less sensitive to AMD polluted water. Fish are also affected by pollution but they can move easier from place to place than the bugs. Fish can swim through an area that is polluted or away from an AMD discharge that only flows once in awhile, without dying. The biggest pollution problems with AMD are acidity and metals (See Formation of AMD ). Siltation caused by the precipitation of metals and excess sediment from exposed spoil piles and barren land is also a problem. The best level for pH in a stream is between 6.0 and 9.0. In many cases AMD pollution will lower the pH to well below 6.0, which also means that the stream has an increase in acidity. Mayflies, stoneflies and caddisflies are the most sensitive bugs to low pH. Within these groups of bugs, different families may be more sensitive than others. Fish presence follows the same pattern. There are some fish that are more sensitive to AMD pollution than others. Once the pH drops below 4.5, most fish are unable to live. Those that do live don’t have enough food because many of the bugs have died. They also have trouble producing eggs, which means the population will decline over time. Metals also affect aquatic bugs and fish. A lower pH means that more acidity is in the water. This acidity dissolves metals from surrounding rocks which allows them to enter the stream where they become more deadly to the aquatic bugs and fish. In a near neutral pH situation (pH 7.0), metals are no longer dissolved and are not considered directly toxic to aquatic life. However, at higher pH levels, metals drop out of solution, becoming a solid and settling on the streambed. These solids can be very sticky and slippery. This can cause other problems. The metal solids can coat the gills and bodies of bugs and fish so they can’t breathe. Also, the solids cover the rocks on the bottom of the stream where aquatic bugs live and fish lay their eggs. This will kill some bugs and young fish. Excess sediment from abandoned mine lands also hurts aquatic bugs and fish. Spoil piles and barren land from mining have little or no trees or plants due to poor soils and acidic conditions. Because they lack plants to hold the soils in place, sediment runs off of these areas and into streams. This can increase cloudiness in a stream immediately following rain storms. This excess sediment in the stream can cover gills and bodies of bugs and fish and make it hard for fish to see to feed. The sediment then settles on the bottom of the stream once the water slows down. As with metals that form a solid, this sediment can cover the stream bottom where aquatic bugs live and fish lay their eggs. It can also reduce the amount of light that reaches underwater plants and cause them to die. Information from “Coal Mine Drainage Prediction and Pollution Prevention in Pennsylvania”, Pennsylvania Department of Environmental Protection, 1998.